Supercharge your life with the purest and most beneficial vibration in the Universe. Appreciation is like a tuning fork for the music of your Spirit – like sunlight for a sprout – a twin sister of Love. Apply this powerful catalyst that will open your heart to True Love and will accelerate its physical manifestation in your life. Imagine starting your day feeling fantastic, fully energized, and overflowing with joy. What if your life was an easy-breezy flow and wonderful synchronicities unfolded every step of the way? If you believe – or would like to believe – that struggling is optional, these daily Mind Journeys will open a new realm of possibilities to you. These meditations are AMAZING. I personally think they are far above average of what’s in the marketplace. 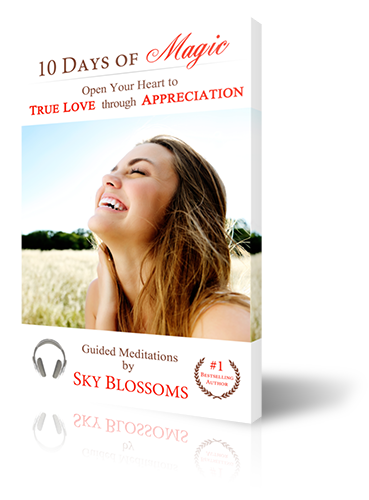 Sky Blossoms truly has a gift for crafting very good meditations. 10 Days of Magic is a different approach to meditation, as as it takes you on a guided journey through many aspects of your daily existence. For me, this brought a different aspect of awareness daily to something I normally might take for granted and instead was grateful for. The approach was so real and so tangible that it was like a workshop built into my meditation practice that inspired transformation. I have thus far experienced a shift in my confidence, decisiveness and just my overall sense of happiness. I recommend these for anyone looking to become more grounded, more confident in your direction and decisions and definitely for anyone looking to improve their current relationships.